The Moon enters Gemini on Monday October 25, and like an adventurous roller-coaster ride, we throw our hands carelessly into the wind and enjoy the fresh breeze thats touches our face. We're letting it all go, and we're holding on to nothing today. As Mercury conjuncts Venus retrograde, our thoughts continue to stay private, as we're careful what we share with others. There's no need to be snarky or feed the trolls today, let it all go to enjoy the day. The rest of the day has a number of aspects that do not mesh well, so we could feel a bit confused as to what we should be experiencing - so simply go with the flow. Our hands are still outstretched and reaching for the sky on Tuesday October 26, as Moon flies swiftly in Gemini, encouraging us to enjoy socializing with those we cross paths with. Communications, writing, and short trips are favorable today. Sun sextiles Pluto in the afternoon, and awareness empowers our confidence and inner strength, allowing our steps to fall into place. Vibrations begin to harmonize, so take hold of the wheel and create the day as you please. On Wednesday October 27, the Moon dives into the emotional waters of Cancer, and while some of us may enjoy all the feelings that bubble over, some of us won't and we'll prove it by putting guards up and withdrawing from the outer world. Agitation could be experienced if there is too much commotion to rub us wrong, so communications can slow down considerably. Nothing should be taken personally today, but it may be hard not to if we're too available to it. Later in the evening, the clouds begin to darken as Moon opposes Pluto, enhancing our senses and allowing us to be more in-tune with the vibrations that surround us. Be still and listen quietly, and you should be able to tap into your intuition as she speaks clearly. You can only control yourself and no one else, and the power to do so is liberating. The evening improves as Luna trines Sun, illuminating opportunities to brilliantly shine and build self-esteem. It's time to put on our seat-belts on Thursday October 28 as life begins to rev her engines into a faster gear, which will no doubt create some major shifts. Mars finally escapes the clammy grips of Scorpio, and enthusiastically gallops his way into freedom with Sagittarius for the next six weeks. Mars is our physical action and influences our energy level, so if you've been feeling as if you've been running on empty, you will definitely enjoy this surge. Rather than acting compassionate and stifling our energy as we hid in Scorpion shadows ~ we're ready to get back to life and back to living! In Sagittarius, we get to experience life more, because we're willing to be available, to travel, and not follow through on what we're doing - if a new opportunity looks better. There are no regrets as Mars travels through Sagittarius, as there is always something to look forward to, new things to learn, and a reason to smile. We stretch beyond our limits, searching for higher knowledge, expanding our goals and willing to go the distance to reach them. We're very reactive with nonstop optimism with this fiery combo, We also carry the potential to react too quickly, behave carelessly, while tripping over our own shoelaces - forfeiting our win at the finishing line. Find time to breathe with each step, to make sure each move is in-sync with our target. Good fortune comes with the right action, but if we rely solely on luck and how quick we are, we're bound to overstep some sort of boundary which could send us back to square one. Use some self-restraint, so that we're not all over the place, and that each step is about quality - not quantity. And do be careful during these next few weeks with any sort of movement because of the intensified speed with this transit. Mars is pushy and aggressive, while Sagittarius is willing to take ANY door that leads a quicker way to avoid pitfalls, drama, and traffic. Too quick of steps can lead us into a balancing act with no coordination, impatiences, falls, road rage, accidents, and mishaps. The heat in this energy plans to squeal wheels and burn some serious rubber... with an acceleration in sexual encounters, partners desperately looking for the exit door, risky moves in personal and business relationships, heated debates, aggressive legal cases, a climb in explosives, the use of firearms, an increase in bullies and forceful actions, fire hazards, active volcanoes, and earth storms. And remember, the Sun entered Scorpio, so we are more intrigued with our dark side, to help us get by in life. In Scorpio, we are searching for self-control and personal power - and how we get that is by using what is private and unseen to others. Scorpio is ruled by Pluto, destroying the toxins in our life, so that we can live life more fully. We are emotionally developing our destiny now, clinging on to whatever is healthy and improving to our life - while exterminating and cutting ties with the negative. Mars in Sagittarius is going to act immediately on our intentions - for emotional security and self-protection. Cancer Moon favorably trines Jupiter, Uranus and Mars on Friday October 29, allowing us to benefit as we express our vulnerabilities. We find ourselves more comfortable with our nurturing side, and as we give love, love reflects it's way back - giving us a nice warm feeling in our bellies. As Moon enters Leo, we're confident that we will get exactly what we're working for, that will help us to soar into the horizon. 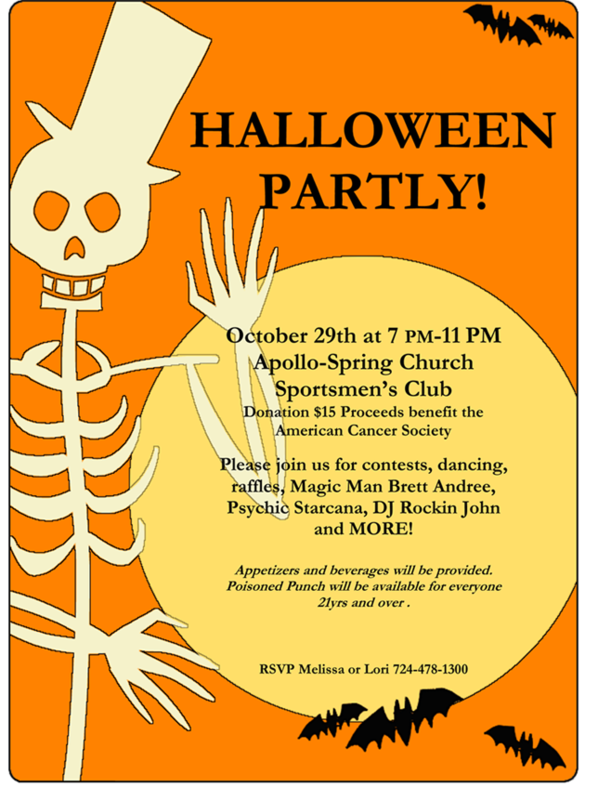 Too, if you're in the local area, I'll be doing more tarot readings at another Halloween party at the Apollo-Spring Church Sportsmen's Club tonight. 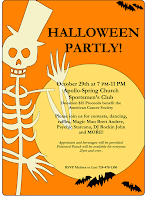 Click the image for a larger view of the information, or forward me an email. We may feel unappreciated on Saturday October 30 as Leo Moon squares Venus retrograde (love, money, and relationships) and the Sun (confidence, life source). Find alternative ways to replenish what you may dependent on others, to help you shine again (or create healthier boundaries on October 29). There is much inner growth within today's challenges that can help us to fulfill our personal promises to ourselves with Moon/Saturn sextile in the afternoon. And if you can't be with the one you love, then love the one you are with. Last Friday, I created my first video on youtube, and if you haven't already checked it out - it's just me having some paranormal fun with very active orbs dancing during the Full Moon, check it here for some 'at home' halloween spirit. Happy Halloween! Leo moon is still strutting her stuff on Sunday October 31, and what better sign than dramatic Leo to get into the part, mood, and costume to take on the stage. As Moon opposes Neptune in the later afternoon, we're more imaginative and experimental. The evening takes a turn toward a more serious note as Luna enters calculating Virgo, taking into account what we lost and gained through the weekend festivities. Enjoy the fun, but be smart and play it safe, don't drink and drive. Also, as Venus retrogrades in malicious Scorpio, she's not being very generous or nice right now, and Mars is behaving as the big dumb prankster in Sagittarius - so be sure to inspect the kids candy before they dig in. It's just always better to be safe, than sorry. And as reminder, daylight savings time ends next weekend, so we'll be adjusting our clocks. While we're doing that, you should add batteries to your shopping list in order to update your smoke alarms.